The Florida Solar Energy Center reports that moisture levels in the home are one of the easiest elements to alter so that mold will not grow in a house. Since people prefer humidity levels that are generally below the critical relative humidity for mold growth to occur, the simple acts of using ceiling fans, reducing the number of house plants in a home and leaving interior room (and closet) doors open can all help reduce moisture levels throughout the home. Wood is a traditional construction material known for its texture and warmth, and many homes to this day use windows with wooden frames for those reasons. 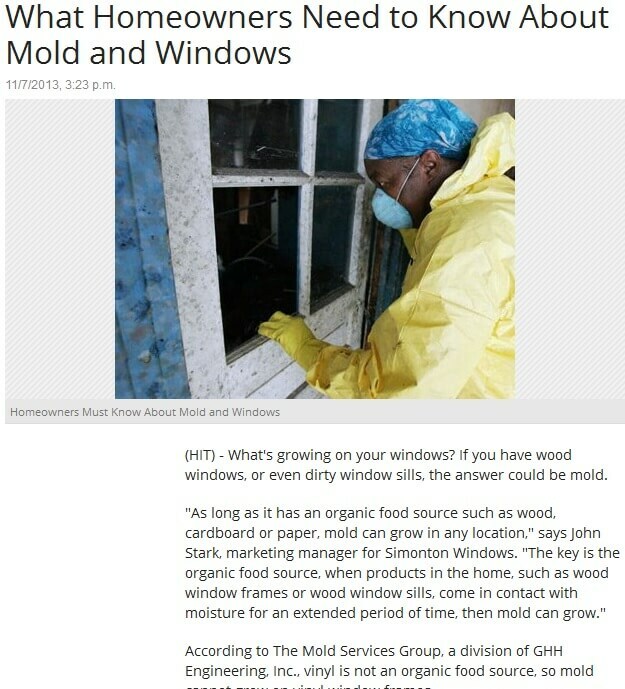 However, as the article says, wooden frames are very prone to mold growths. Thankfully, a skillful wood window replacement in Detroit, Michigan using vinyl window replacements can address this problem. Unlike wooden windows, vinyl windows require little to no maintenance; and because vinyl does not tend to retain moisture, cannot lead to the formation of mold on its surface. This moisture-resistant property also protects vinyl windows from the kind of warping and movement that wood windows go through when exposed to the elements. Additionally, vinyl windows do not even need to be painted, and only require occasional cleaning. Older, historical homes were typically constructed with wood windows, which by now may have seen better days and could be showing signs of aging and deterioration. A Detroit, MI wood window replacement company such as Kroll Construction can replace the old frames with more durable and efficient vinyl fixtures. It is important to note, as well, that newer vinyl window models have been designed and constructed to closely simulate the look of wood, which helps preserve the curb appeal of a historical home.